Please pardon the break from my esoteric soap box to address something important that comes up often in my practice. I have slipped in a few sarcastic statements if you’d like to count them – consider it a game. Frequently I have property owners (or soon to be property owners) contact me interested in developing property or renovating an existing building where the early discussion revolves around what will the code permit. It is common for them to mention a discussion they had with local municipal officials where something goes wrong (often horribly – no offense intended to government officials). They state something that demonstrates a misunderstanding of the difference between a local zoning ordinance and a building code. I tried to say that politely. When I get involved and start to do research, I find that people often misunderstand the difference and it is not uncommon that decisions are made based on misinformation prior to my involvement. I surmise this is probably a bit of fault from both the property owner and local officials not speaking the same language (that’s figuratively…I think). However, both types of regulations are in place to protect the public’s safety and the overall quality and value of the community. They seek the greater good over the individual and are based on years of research and data from situations where people made…let’s just say…poor choices. Now this may not be as exciting as one of my normal rants, but it is one that is very important for people to understand. Now here is the simplest way I can share the difference in a non-technical, non-legal way. Most municipalities in this country have adopted some type of zoning ordinance or land planning regulation to govern how development and improvements can be made within the borders of their municipality. These are usually adopted by cities, boroughs and townships. They often have a similar overall structure to them and a basic list of items that they address. The primary thing to understand about a zoning ordinance is it is concerned with how the property or the land is used and how that affects the surrounding community. It is less interested in the building other than limits on the use, size, height and position on the land itself – as that relates to the classification of the property. Whether the building is made of brick, wood or marshmallow is of no concern to a zoning ordinance (ok, there might be some exceptions out there…and I don’t build real buildings out of marshmallows…anymore). In every zoning ordinance one will find that the municipality is separated into zoning districts. These are normally divided into basic categories such as residential, commercial and industrial zones. Within each of these districts are sub-levels with guidelines for density, height and other measures of quantity. It does this by placing limits on where one can build on the land, how much and how high. Lastly it will address how the automobile interacts with the property, such as access and parking. There will be some type of formula that will stipulate how many parking spaces are required as a function of the use or size of the building. Dealing with storm water is also included in municipal planning guidelines. Beyond that there are often other regulations and methods of addressing when things don’t fit within the guidelines. In other words, there is some type of variance or appeal process that is in place to deal with unusual conditions and odd requests. Perhaps we’ll explore the variance process at a later time. Regardless of what the specifics are, for every type of development, improvement or other changes to a building or property, one should always start with the zoning regulations even if the building occupies the entire four corners of the property. It may be a cousin or sibling to the zoning ordinance but the building code (often called “code” in lazy slang and vernacular speech) is concerned explicitly with the physical building itself. It has much to say about the physical features of the building, primarily to address issues of life safety and handicap accessibility. You might find interpreting the prophets of Old Testament an easier chore, but without these voluminous tomes, people would just make…more poor choices. Believe me, I’ve seen it. Most of the United States is governed by some type of building code. Furthermore, most of the United States is governed by the International Building Code and all its related cousins that are developed by the International Code Council in Chicago, Illinois. If that isn’t the code being used, I’d bet the one in place is very similar. Building codes are divided into many chapters addressing the many minimal quality or safety levels for every part of a building. I won’t even begin to explain all of these except to reiterate that the code represents the lowest level of acceptable safety. However, one initial classification to determine is the occupancy or the use of the building. In other words, what is the function of the building? Is it a residence or a museum? Is it an office or a factory? These categories are related to the risk factor of the building as well as the number of people (occupant load) for that use. The more people in the building, the more features are required to ensure safety, especially for an emergency situation. This designation is critical because people often wish to change the occupancy when they purchase a building and that brings in Ms. Pandora and her box. This is just the beginning of describing the building code, but as you can see, it relates to the physical building itself. Everyone has a different opinion on regulations. I’ve heard you sighing and watched you roll your eyes as you’ve read this. Most people I encounter aren’t thrilled with regulations and I’ve had a few people become borderline hostile towards them. This is primarily because these regulations have a direct correlation with money. That doesn’t mean codes and ordinances are unfair, it just means people need to prepare their budgets wisely and calibrate themselves to the true costs of construction with respect to the regulatory environment — early in the process. It’s also wise to meet with the local officials early in the process and partner together rather that become adversarial. If you are a property owner beginning to come to terms of these issues, the first thing I would suggest is talk to an architect who can guide you through the process and document where and why conclusions are made. We always start with zoning since there is no point dealing with building issues when the land regulations precede building details. From there we can review your plans against the regulations and see where items need to be addressed. Our firm has done and always recommends some type of feasibility study or due diligence study before any design and preferably before one buys the property. If you are not ready to commit to that yet but choose to talk to the local officials, take good notes and don’t let yourself settle for the “he said all I have to do is…” situation. 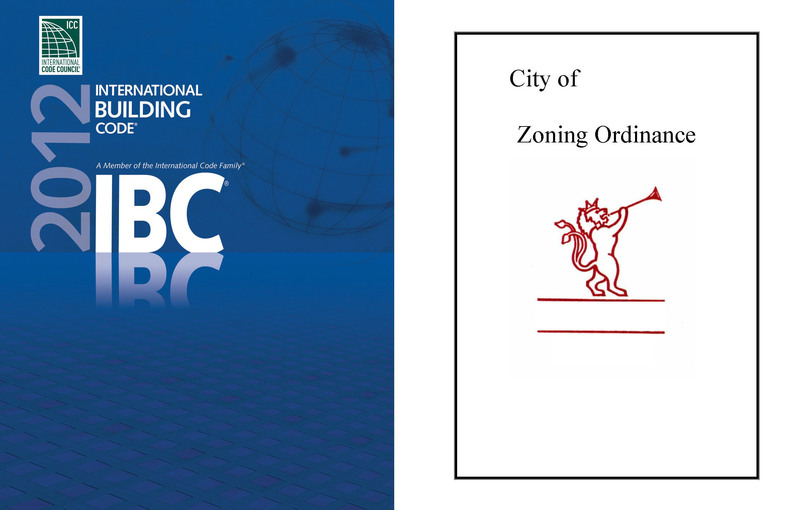 Every requirement can be connected to some section of a zoning ordinance or building code (chapter and verse). Don’t simply rely on what someone told you. Love this description, and it’s even accurate for Canada! Do you mind if I reblog your post? Thank you. Please just link or reference my blog as author. Well, there’s that. I agree and don’t like when I’ve had to deal with municipal regs that stipulate things like that. I had a project years ago when working for another architect where the thick binder dictated materials, colors, etc. It’s a hard balance to have design guidelines and personal freedom….blog fodder? “Very minimal” using one word equalities. NB: I found getting past the explanation of the required “Plumbing, Mechanical (HVAC), Electrical, Accessibility, etc.” and their costs a future hurdle with the owner. Excellent handling of the subject especially the diagrams. 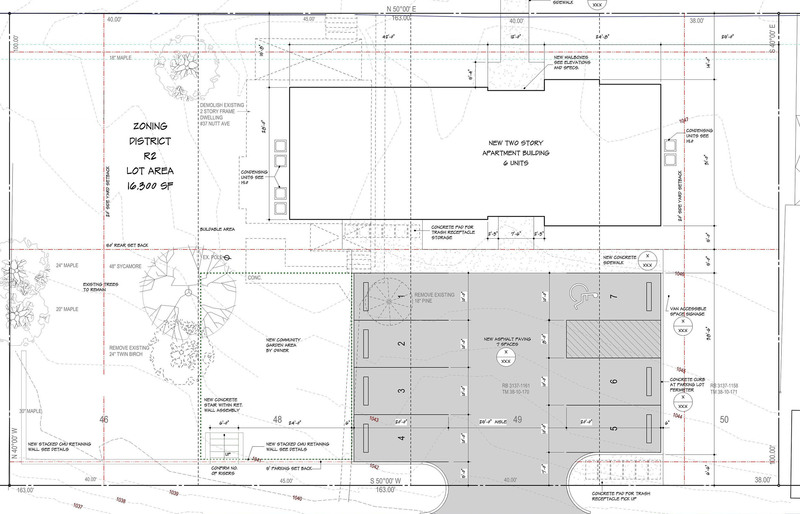 Bill – can you believe an architect could use such minimal wordings? Yours are equally as good, but I had to discipline myself for once! I do believe that using minimal words and not reaching into “The Thesaurus of Academic Architectural Speak” reaches more people. Education in using the minimal wording is not “Dumbing down” but building up clarity and understanding of the Architects value. When we get to hear “Why don’t you get an Architect to do the work?” from the populace Architecture will have a “Street Value”. I find part of my job is to speak ‘building and code’ and well as ‘contractor’ and be able to translate for/to the owner. When I served on a zoning board I had several lawyers refer clients to me to explain the whys of zoning to clients who needed the translation! And, yes, I did translate back to the Town officials. I have found that the truth lies somewhere between both stories, the officials and the client. Officials need to slow down and explain things better. Clients need to listen, pay attention and admit they need help…and pay for it. I have actually spoken with a few officials in my city begging them to be more careful. If you’ve ever wondered about the difference between zoning and building code, especially if you’re looking at a new site for a project, Lee Calisti has an amazing post over at his blog think|architect. It applies to Canada just as much as the United States. 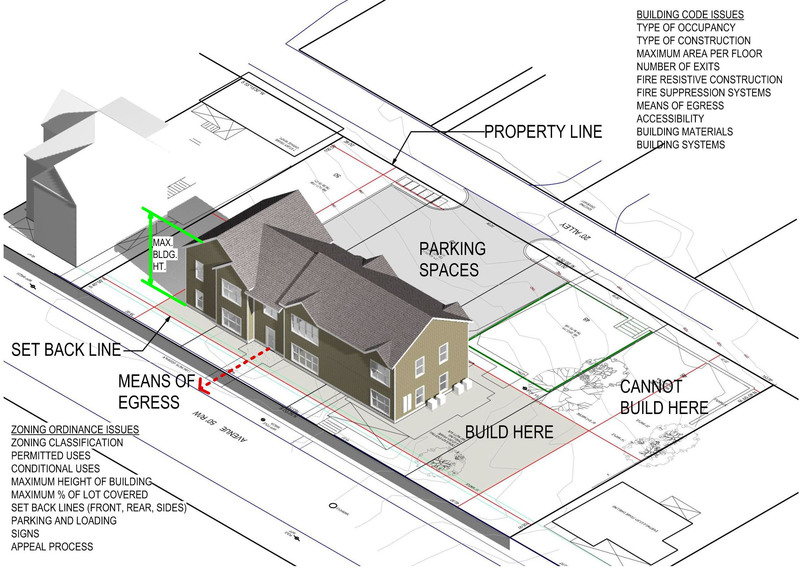 Great and to the point description of ‘zoning’ and ‘code’. Will be posting your article on my Facebook page (linked to your blog). Thank you. As a client you should be aware of the differences between Zoning and the Building Code, Lee does a great job of explaining it. Should an Architect be familiar with all building codes? What happens when the architect overlooked a code and costs the building owner more money to make an appeal for minor variance approval? Obviously, no one can know everything and we occasionally miss things. The standard of care that is expected as a professional does not expect perfection but judges us against what other professionals would do in a similar situation in the same jurisdiction. Call that subjective perhaps. In the case of overlooking a code item that causes additional cost, several outcomes could occur. First, if the item is required anyway, but was not included in the bid, then the client pays for it (look up the topic of betterment). However, if costly reconstruction is required to include the feature after the fact, then it could get unpleasant. This is why good communication and relationships are important. Sometimes we can just apologize; on a rare occasion, we’d have to pay for it. There is no easy answer.